Decorating your home with originality shouldn’t be a chore, but finding something unique at a department store can be difficult, if not impossible. Our selection of planters and pots are handcrafted by artisans and small family businesses, making them unique, one-of-a-kind creations. Because we deal direct with small family businesses, we cut out the middle man and pass the savings along to you. This means you can find the planter or pot you’ve been looking for, and purchase it from us at an affordable price. Our selection must be seen to be believed, so join us at our new location and plan on staying a while. 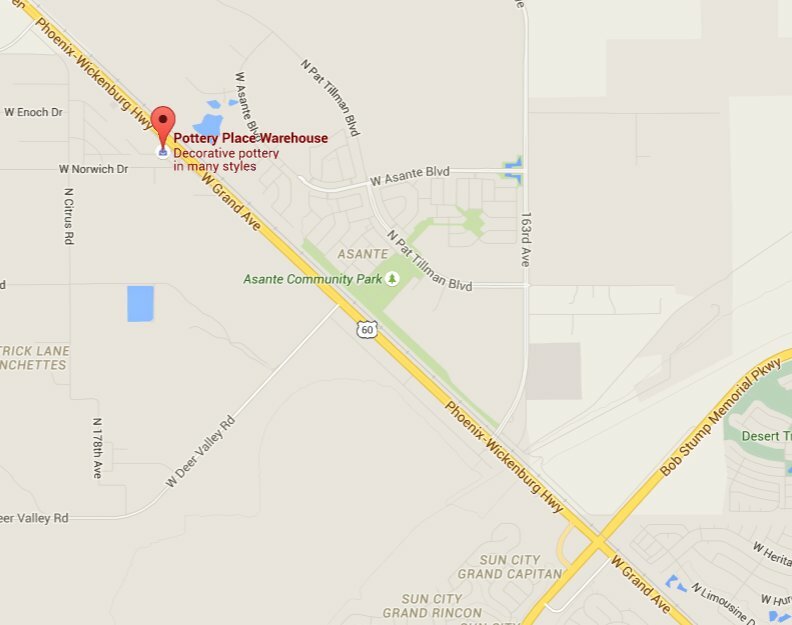 Follow this link for directions to The Pottery Place Warehouse on Grand Ave, or call (623) 214-9080 if you want to find out if we have what you’re looking for in stock. Most likely we do, and our store is perfect for, “I’ll know what I want when I see it,” so take your time and browse our gigantic selection of pots and planters. In Phoenix and the rest of Arizona, pottery is more than just an decorative afterthought. Pottery represents proud traditions carried on throughout the ages, with styles that reflect the many indigenous peoples that designed and made them by hand. From outdoor pots that hold succulents and other native plants, to indoor creations that are true works of art, we have pots that will bring any space to life with color and design. Our large selection of pots come in many styles – from contemporary to Spanish Colonial, and Southwestern to Tuscan. With so many motifs represented by our in-stock inventory, you won’t have any trouble finding a large centerpiece for your living room, or a small pot for your dining room table. With both indoor and outdoor pottery available, you can decorate your home in just about any way you can think of. For outdoor use, we have pottery that is both beautiful, functional, and durable. Many Phoenix, AZ homeowners use our pots to decorate and accentuate their garden, poolside, or back porch. Combining colorful pots with various plants, succulents, and cactuses brings charm to any outdoor living space, and your decorative options are limited only by the imagination. shelf, or a ceiling recess. We have handmade merchandise that will match your existing decor, or give you new ideas if you’re in the midst of a remodel. For outdoor planters, you will find a selection of durable and beautiful creations, made by artisans in their own studios. Planters are a great way to add plants and succulents to your outdoor garden, whether you’re decorating your front yard, or your own private backyard garden. We have many different styles of planters for your Phoenix, AZ home or business, no matter what style of decorations you prefer. From Southwestern themes to Spanish Colonial, you’ll find designs and colors that inspire and bring life to your indoor and outdoor spaces. Our new location on Grand Ave. boasts far more space than we’ve ever had before. Shopping with us is more of an event, so if you’re planning a visit leave ample time to browse and find the perfect planter or pot for your home. Follow this link for directions to our new Pottery Place Warehouse location. If you would like to get information about items we have in stock before visiting, you can call us at (623) 214-9080, and one of our sales agents will assist you.